Isaiah 6:2-3 Seraphs flying in Reverent Awe. Isa 6:2 Above it stood the seraphs; each one had six wings; with two he covered his face, and with two he covered his feet, and with two he flew. Isa 6:3 And one cried to another, and said, Holy, holy, holy, is Jehovah of Hosts; the whole earth full of His glory. Notes: Above the Throne of God were Seraphim. 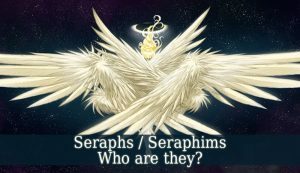 They and Cheribim are the Highest echelons of Heavenly Beings. They are charged with the Protection of the Throne of God. v.2b. With two wings they cover their faces….. Even though they are such powerful creatures of heaven they cover their faces out of reverential fear of God and His Son who is seated at His Right Hand. 2.c With two wings they cover their feet. What an amazing picture. They cover their faces and their feet. What respect and what Protection and humility? v.2.d. With two they were flying. It seems that they did not stay in one place. The situation was so holy and the atmosphere so charged with the presence and power of God, they were continually on the move. See (Rev_4:8). The Trinity is implied (on “Lord,” see on Isa_6:1). God’s holiness is the keynote of Isaiah’s whole prophecies. JFB Commentary says: whole earth — the Hebrew more emphatically, the fulness of the whole earth is His glory (Psa_24:1; A Psalm of David. The earth is Jehovah’s, and the fullness of it; the world, and those who dwell in it. Psa_72:19). And blessed be His glorious name forever; and all the earth is filled with His glory! Amen and Amen. Previous Post Isaiah 6:1 Isaiah’s Call as a Prophet of God.